Bees are not the only animals that carry pollen from flower to flower. Species with backbones, among them bats, birds, mice, and even lizards, also serve as pollinators. Although less familiar as flower visitors than insect pollinators, vertebrate pollinators are more likely to have co-evolved tight relationships of high value to the plants they service, supplying essential reproductive aid for which few or no other species may substitute. In plants known to receive flower visitations from vertebrates, fruit and seed production drops 63 percent, on average, when the larger animals, but not insects, are experimentally blocked from accessing the plants, ecologists report in the March cover study for the Ecological Society of America's journal Frontiers in Ecology and the Environment. 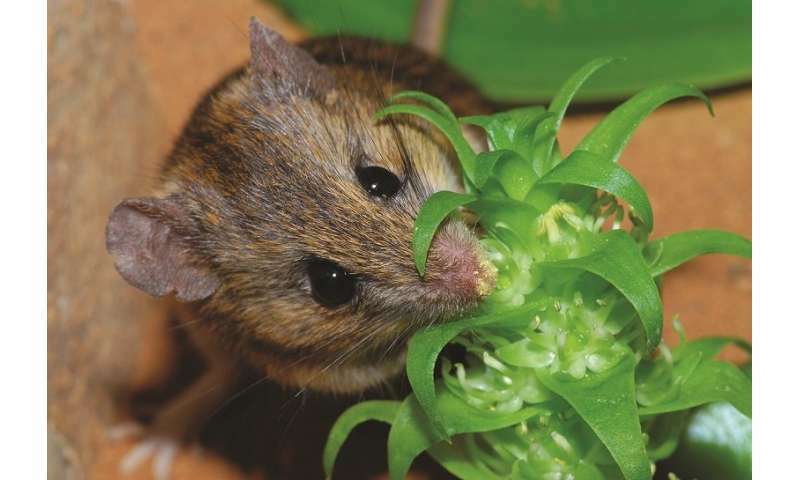 Fabrizia Ratto and colleagues reviewed 126 such animal exclusion experiments to get an idea of how dependent wild plants are on animals with backbones for reproduction. The researchers selected published studies that quantified pollination through the subsequent growth of fruit or seeds. The exclusion of bat pollinators had a particularly strong effect on their plant consorts, reducing fruit production by 83 percent, on average. Bats pollinate about 528 plant species worldwide, including crops like dragon fruit, African locust beans, and durian, Southeast Asia's "King of Fruits." The authors speculate that chiropterophilous, or bat-pollinated, plants are unusually dependent on just a few, related species to carry their pollen. Many bat species have coevolved intimate interdependencies with the plants that feed them in exchange for pollen transport. Among them, blue agave (Agave tequilana), the source of tequila, depends entirely on the greater (Leptonycteris nivalis) and lesser (Leptonycteris yerbabuenae) long-nosed bats. The cacti open their long, narrow flowers only at night, luring in the bats with the fragrance of rotten fruit. Both bat species are endangered or near threatened. Loss of pollination by vertebrates had a higher impact in the tropics, where the study found a 71 percent decline in fruit or seed production. This higher impact may reflect the higher degree of customization for specific pollinators, the authors say. Like the agave cacti, specialized plants that rely on a small number of species of animal helpers for their reproductive success are more vulnerable to disruption. Non-flying mammals are also pollinators, visiting at least 85 plant species worldwide. Ruffed lemurs (Varecia variegata) may be the largest pollinators, known to pry open the tough flowers of the traveler's tree (Ravenala madagascariensis) for a nectar treat on their native island of Madagascar. The lemurs, which rely on the nectar for many of their calories, leave the flowers intact and carry pollen on their fur. Possums and squirrels also pollinate plants. Because empirical studies have only been conducted with species of mice, Ratto and colleagues' analysis cannot give a picture of the importance of non-flying mammal species for plant reproduction. Over 920 bird species pollinate plants, forming the largest contingent of the vertebrate pollinators and pollinating about 5 percent of plant species in most regions. The reliance of plants on birds tends to be higher on islands, where birds typically pollinate 10 percent of the local flora. 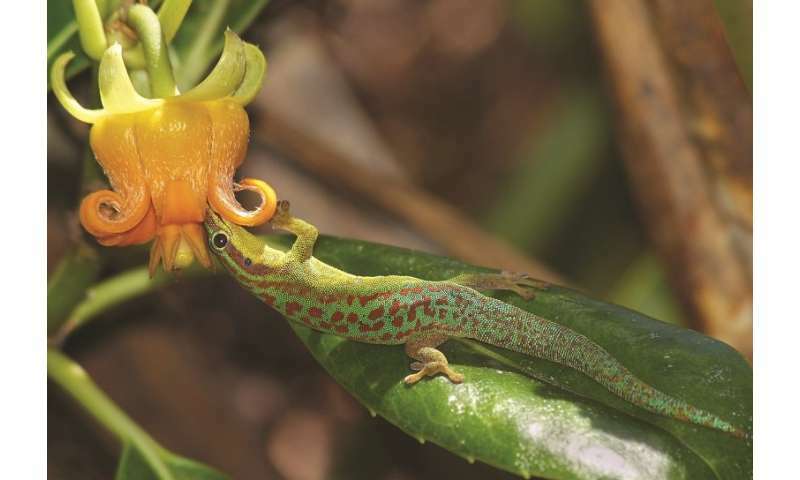 Perhaps most surprisingly, some lizard species are also pollinators, especially on islands. The distribution and health of vertebrate pollinators is well documented compared to insect species, allowing, the authors argue, for targeted conservation efforts. As pollinating bird and mammal species fall under increasing pressure from habitat conversion to agriculture needs, fire, hunting, and invasions of non-native species, their plant companions and other species that feed on fruits and seeds are also at risk.